OK. This is a technical tip for those who might be starting to embark on an IoT product venture. I have seen many people immediately choose the fundamentally WRONG technology from the start for their IoT product. I don’t want you to start the journey on your left foot! If you are just starting to think about an IoT product venture, one of the first tech problems you will need to solve regards the use-case and range in which your IoT product will be used. As always, life, engineering, and business problems cannot be solved with a “quick tip,” but this article will at least get you “out the door” and walking in a straight line toward your solution. So, one of the first things you will want to do, based on your product use case, is determine the “IoT Realm” in which your product fits. 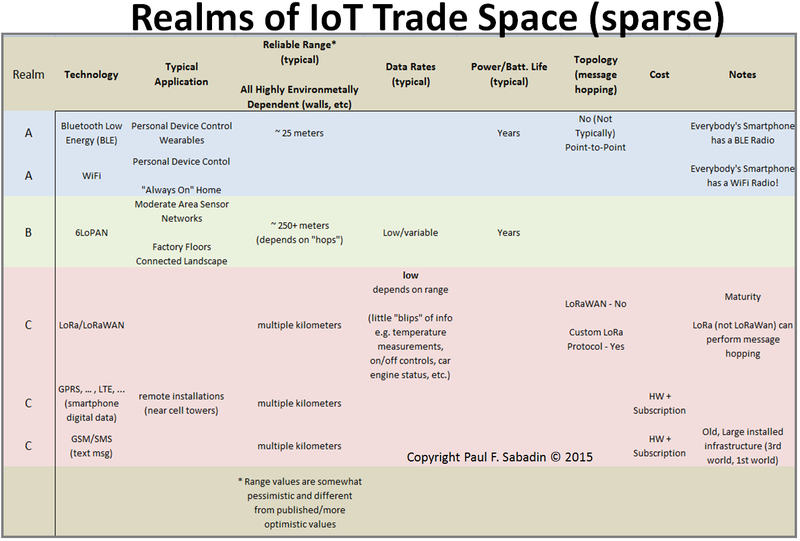 I call these “IoT Realms,” where in this case, realms are roughly associated with range. It is of absolute importance to understand that other things, such as data rate and topology, are very cautiously omitted from this conversation because, well, this would not, then, be a “quick tip,” would it? So, with the above caveats, for data-oriented IoT connectivity we can start by placing your application use case into, somewhat arbitrarily chosen, realms. Let’s Label them Realm A, Realm B, and Realm C, where each of these realms is, generally speaking, differentiated by the application’s need for radio link range. Realm A is a where many, direct, point-to-point, nearby home automation products fall. These are often not the smartest devices, and will typically be a wireless means for a “longer lever” with which to get something done in the home/office: change the channel on the TV, turn on/off a light switch, monitor your health with wearable devices, and stream music or video. Sound like Bluetooth? Well, yes. Bluetooth (or now, Bluetooth Low Energy – BLE) is often a good choice for this kind of glorified remote control. Most smartphones already have radios in them that will work for BLE. If you look at the marketing material for the Bluetooth Special Interest Group (Bluetooth SIG), you will see precisely these kinds of applications discussed. Though radio range is extremely variable based on where a BLE transmitter or receiver sits (behind walls, near metallic objects, etc. ), we can put a rough range of 75 reliable feet on it. BLE is, primarily, a single link connection (e.g. from your smartphone to your heart monitor) and has not been associated with data messages “hop-scotching’ from device to device to reliably deliver a message through a network. Important: If an end device needs to continue to communicate and operate when your smartphone leaves the building, then you may not want to use BLE to connect it to IoT. Certainly, there are strong efforts underway to bring BLE under a more “networked” topology, but those efforts are nascent. 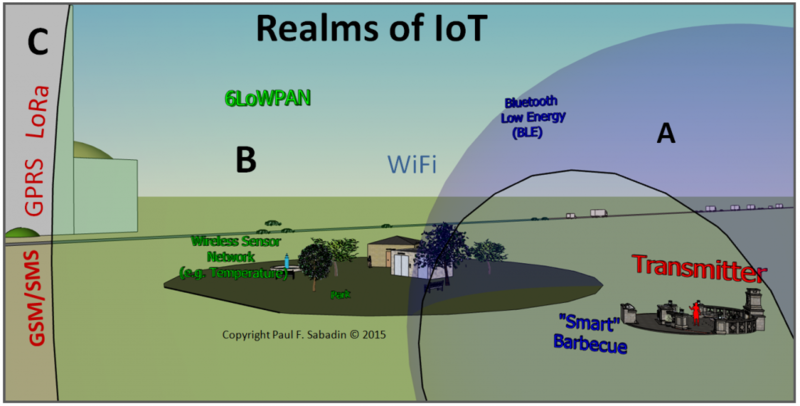 IoT Realm B is made up of longer radio range technologies, typically, than Bluetooth Low Energy. Not because of the radio link line-of-sight distance between transmitter and receiver, but because the hardware and software infrastructure that was developed for this realm is explicitly intended to be networked , allowing each radio (or “node”) in the infrastructure to act as a sort of smart repeater, receiving messages intended for a more distant end device, and passing data to the next node (“repeater”) in the chain, repeating until the final end node receives the message. That way, significantly longer ranges can be reached through multi- hops. The standard curated by the 6LowPAN (IPv6 over Low power Wireless Personal Area Networks) group at the IETF is a primary example of a Realm B IoT technology. It is somewhat arbitrary (because of the increase in range as more middle-node sensors are added), but let’s say that the reliable link range of IEEE 802.15.4e network is about 250 meters, if the nodes are spread evenly over an area about a central point. The distance is much farther if they are aligned, single-file, along a single line. This networked means of communication, in its most fundamental form, has great precedent in that it is the way the Internet, itself (TCP/IP), does things. This way of doing things in an interconnected mesh can have its limits with respect to scalability. It has been claimed that when the network approaches about 100 nodes it starts to slow down of its own weight. Technologies in Realm B that are doing this today are often standardized on IEEE 802.15.4e with time-schedule channel hopping (TSCH) whereby each node maintains a tightly synchronized clock with other nodes, “sleeps” to save battery power, and wakes up at a calculated time to get and relay messages to other nodes, and then goes back to a timed sleep. The method also uses channel hopping (changing RF frequency channel) in a semi-random way so as to spread data transmission more evenly over RF bandwidth and to add additional security to communications (it is difficult for an outside “listener” to determine exactly what channel two adjacent nodes will be communicating on when those channels change in an almost indeterminate [as seen from the outside] way). In terms of market participation, The Thread Group, spearheaded by Google Nest [smart thermostat]) and populated by Samsung and other companies, have essentially been built on standards in Realm B (namely, IEEE 802.15.4). Now, I have optimistically written of this technology in the past (see this article). However, there is, admittedly, an uncomfortable dearth of affordable radio/firmware modules and development tools or consumer end-products available that are based on this standard. So, tread carefully if you decide to build your IoT product with Realm B “hop-scotching” technologies. In Realm C is a group of longer range technologies that, like the others, is new and, as yet, untested, in commercial US markets. However, technologies in this group have many positive attributes and seem to hold much promise for a more robust and truly ubiquitous IoT world. The ranges for radios in this technology realm are on the order of kilometers … significantly better than the above technologies. Technologies in Realm C include GPRS (cell phone data technology) and a newcomer, LoRa and LoRaWAN, that I have recently written about, here. GPRS is well understood technology, so won’t be discussed, here. On the other hand, LoRa (for Long Range) attacks the Iot range challenge by trading data rate for range, making it a great choice for low data-rate sensor measurements or infrequent remote actuation of IoT devices. Further, the inventor of this LoRa technology, Craig A. Hornbuckle, seems to have nailed (in a good way) the development of the on-chip signal processing for LoRa. LoRa is essentially a radio-to-radio communications technology (PHY and MAC layers). In contrast, LoRaWAN is a technology is a larger standard, curated by the LoRa Alliance, and defines how these individual radios are assembled into a larger network and, ultimately, interconnected with the Internet. The LoRa Alliance is populated by such heavy-hitters as IBM, CISCO Systems, ST Microelectronics, Semtech Corporation, Tech Mahindra, Microchip Technology, and other companies. Though being spoken of, primarily, for use by telecommunications carriers (cell phone carriers) LoRa technology seems to hold great promise for almost any low data-rate IoT application. I do not see many reasons why this technology could not, actually and ultimately, span all of realms A, B, and C. So I still, cautiously, contend that LoRa is a technology to watch. Again, it will take support and investment by the makers of the LoRa technology stack to stoke developer buy-in and ultimately make it a market success. This could be a long road so, once again, tread gently. So there you have it. I hope this short discussion helps you to better choose a radio technology on which to start your IoT adventure. Paul F. Sabadin is president and founder of Blue Marble, Inc., makers of the Blue Marble Irrigation system that uses IoT technology to deliver the perfect drink to every crop on your farm and every plant in your garden. Paul is the first place tech invention winner of San Diego 2015, an IoT evangelist, and has decades of experience leading engineering teams on high technology projects with companies such as Boeing, SAIC, and BAE Systems and Silicon Valley and other California Internet companies.